This set of stamps is the result of a wonderful collaboration with The Naughton Group, a Hong Kong-based graphic design and marketing company set up by Dominic Naughton in 1995 with whom we collaborated on the Year of the Snake stamp issue in 2001. Pigs also possess a beautiful personality and are blessed with good fortune in life. Recent years of the Pig are: 1935, 1947, 1959, 1971, 1983, 1995, 2007 and 2019. 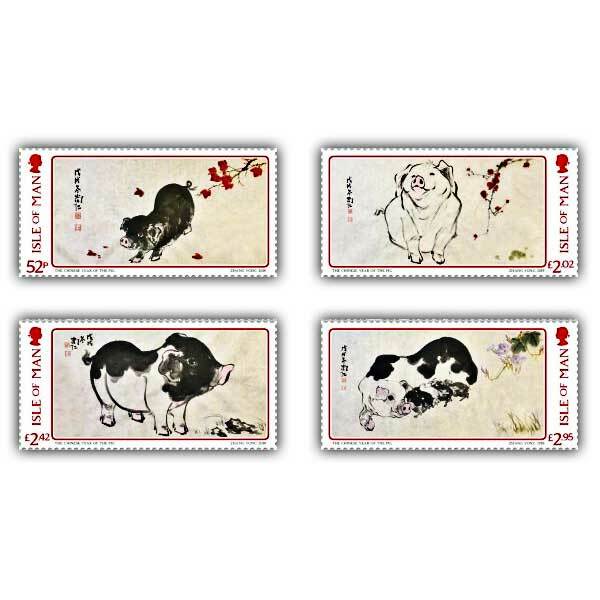 This set of delightful stamps feature paintings by Zhang Yong, a chinese visual artist who since childhood was tutored in Chinese painting under Mr Luo Jintang, an artist of the Lingnan school of painiting and a cultural relics expert in Guangdong Province. Later, he was taught by Mr Ye Quan, a famous Lingnan painter. Zhang Yong is currently a member of the Guangdong Youth Artists Association, a member of the Guangdong Collectors Association and is the distinguished artist of the Studio of Political Consultative Conference of Guangzhou Haizhu District.